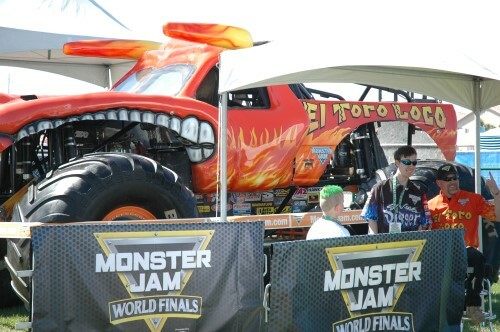 Welcome to the Monster Jam World Finals, taking place here in Las Vegas, NV. 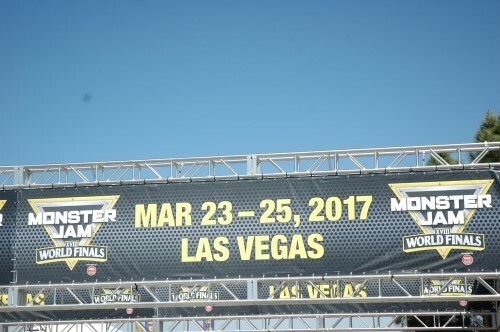 Normally I would share the road trip or airport visit with you, but this is just across town so I’ll spare you the pics of traffic. 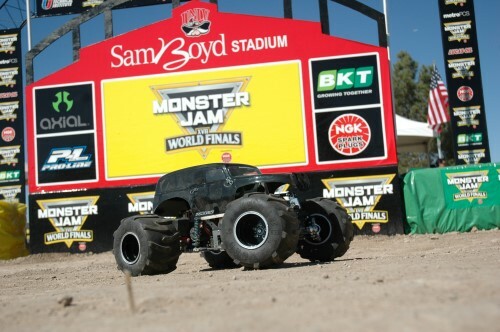 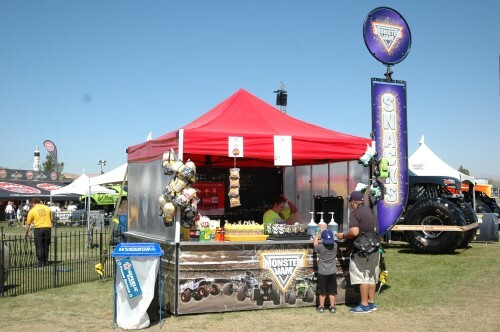 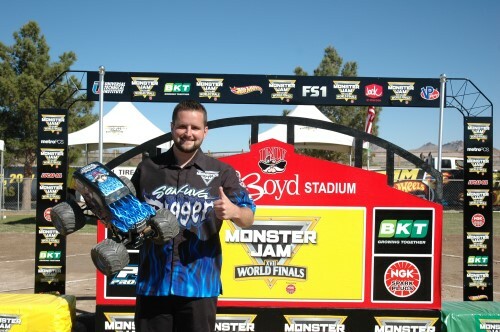 So do you want to know what’s at Monster Jam World Finals? 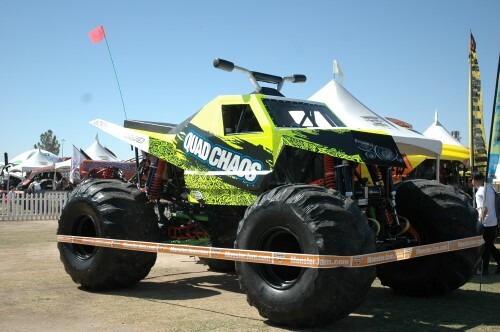 I will start by saying a lot! 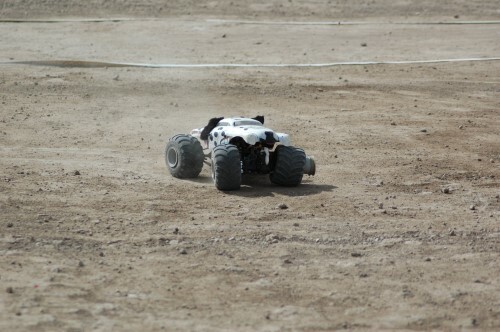 More than I could possibly show you in one blog. 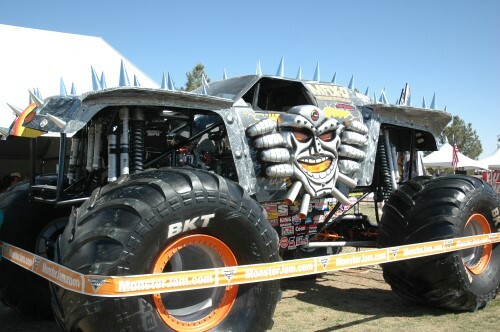 Of course you will see Monster Trucks both past and present. 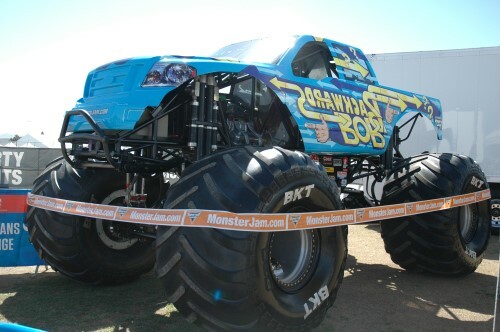 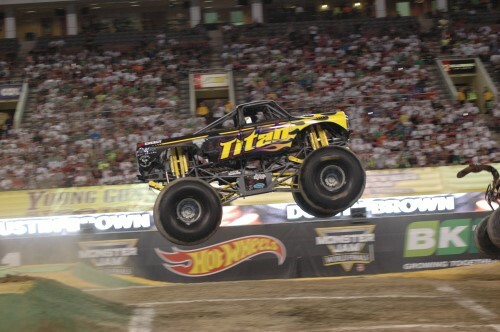 If you don’t follow Monster Jam this may look like an ordinary truck, other than the body is on backwards. 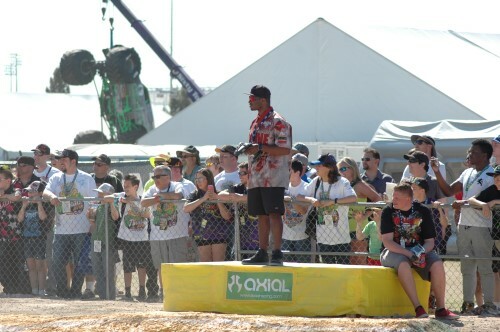 You might be right. 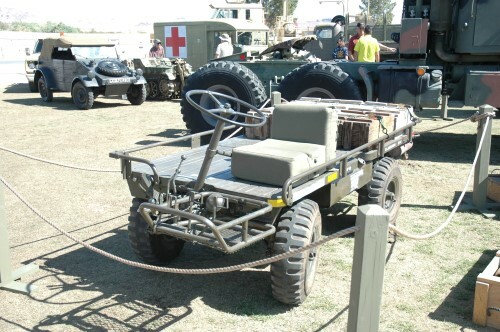 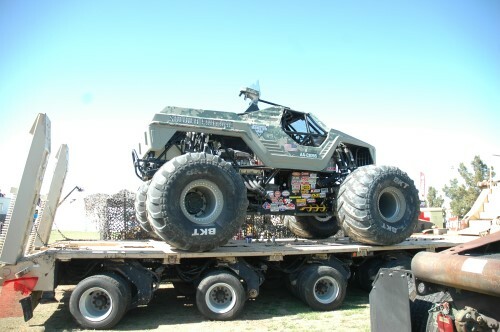 Soldier of Fortune camp had some very cool military rigs. 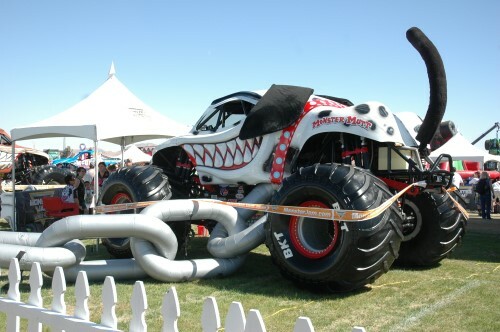 Like this beast; I am not really sure if it’s a trike or motorcycle, but I know it looks fun! 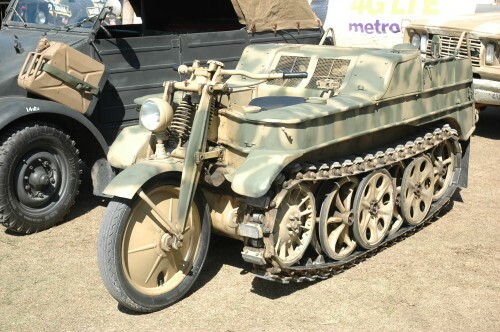 How many of you could use something like this? 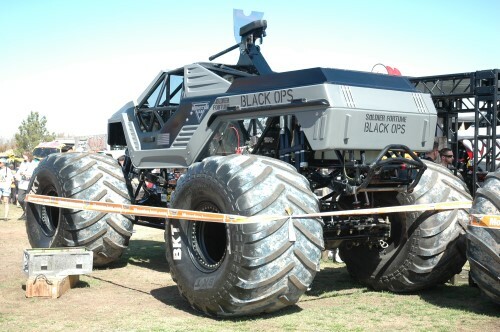 I can admit that I don’t need it, but I sure would like to have it. 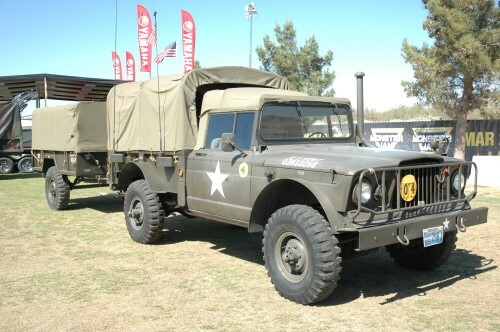 Maybe you’ll recognize some of these trucks. 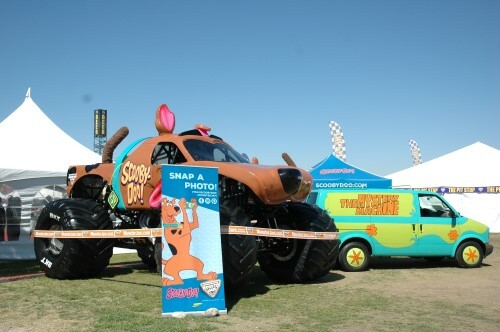 Or maybe you wont, but maybe you will find them as cool as I do. 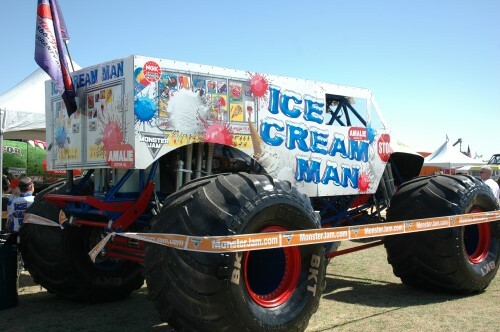 I think you could make a monster truck out of most anything if you have the imagination. 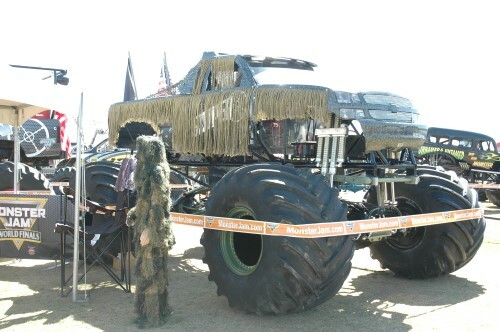 I wont venture to guess the cost though, but can you really put a price tag on fun? 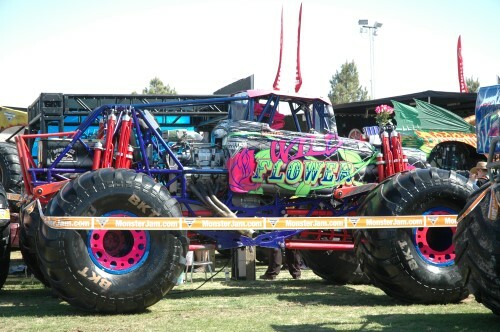 Wild Flower really jumps out with all the vibrant colors. 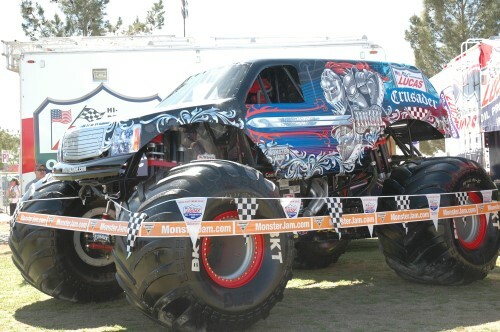 American Sniper kind of draws you in, even with all of the other monster trucks around. 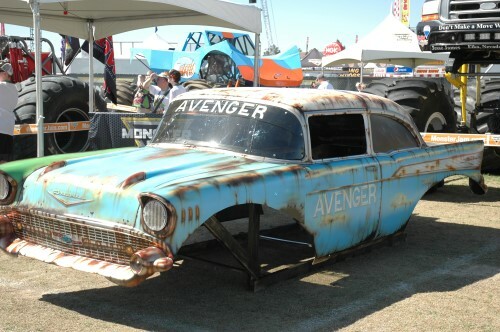 The Avenger body is a work of art. 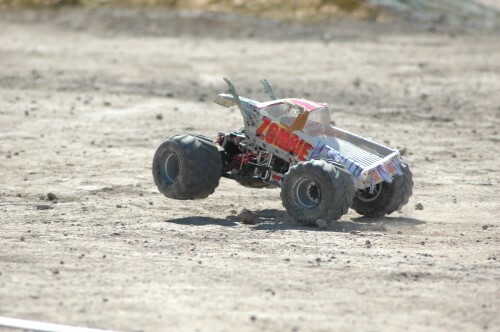 It can’t be easy making a body look this weathered. 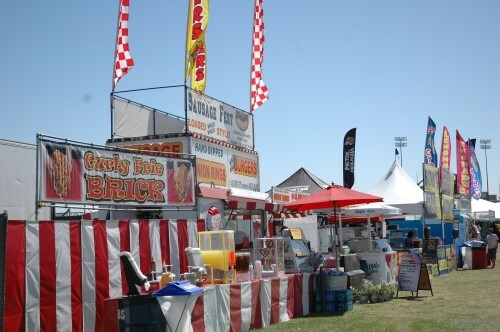 There are plenty of snacks and food on the premises. 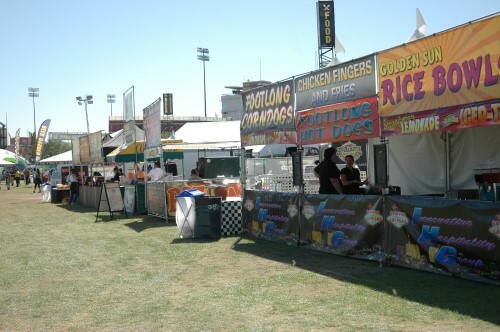 No lines so take advantage of the Double Down package! 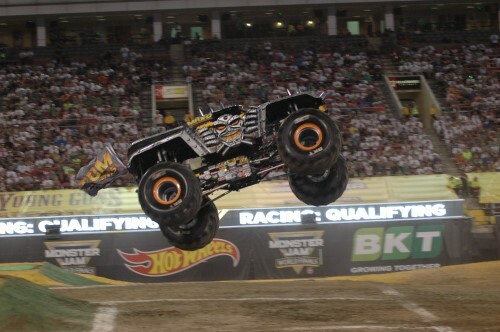 Check out Monsterjam.com to learn about this offer. 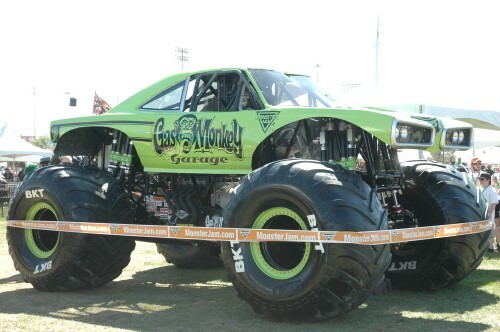 Gas Monkey Garage jumped out at me too. 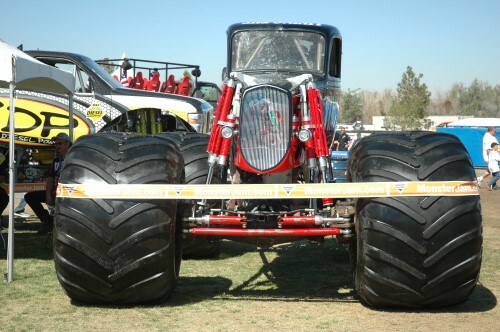 There is just so much to see. 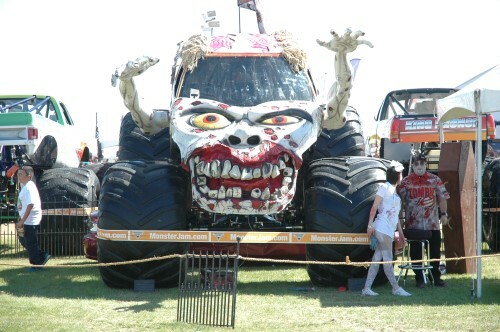 One of the Zombie trucks on display, complete with two zombies. 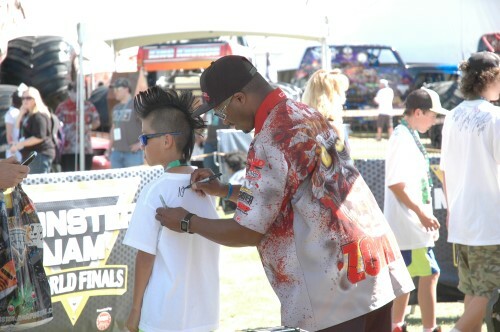 Drivers are signing autographs and taking pics with fans. 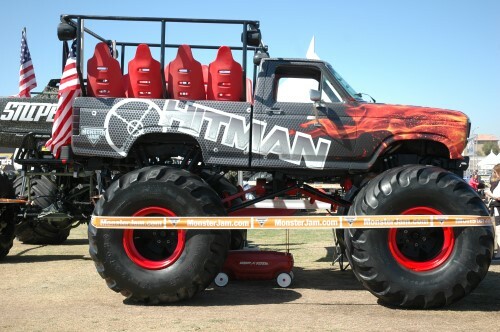 Ride trucks are an option too! 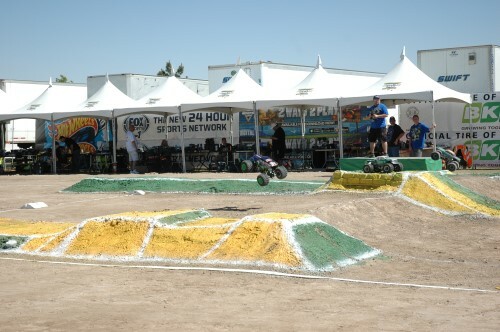 The entertainment zone is just that, there are quad races, freestyle bicycles, and motorcycles going on at the moment. 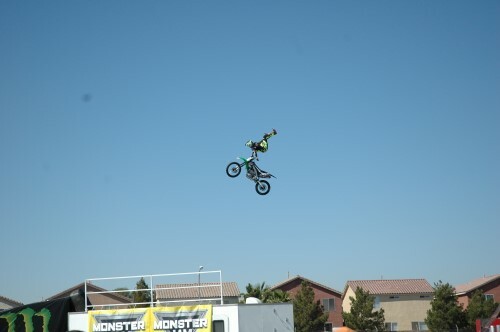 Non stop entertainment here. 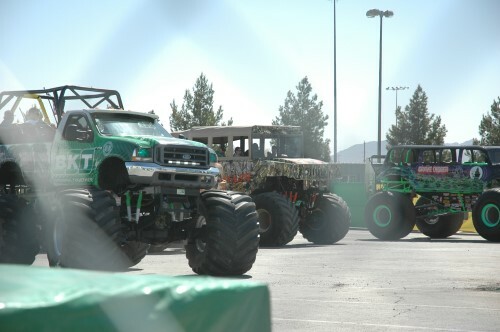 I believe there are over 100 monster trucks here. 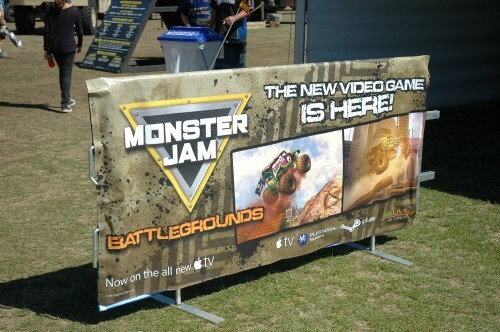 There is even a Monster Jam video game. 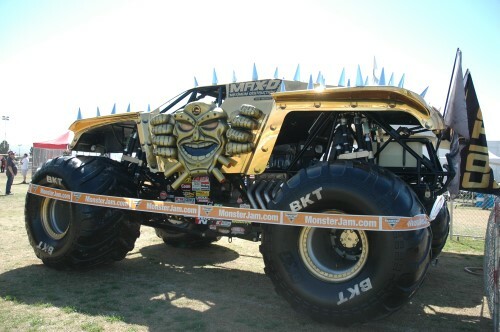 I am convinced that everything Monster truck can be found here, probably even more than you realize. 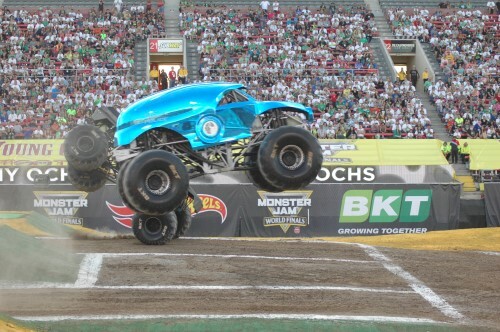 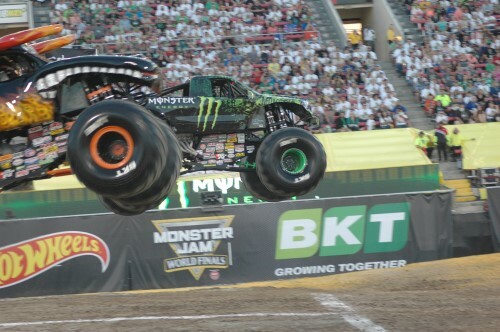 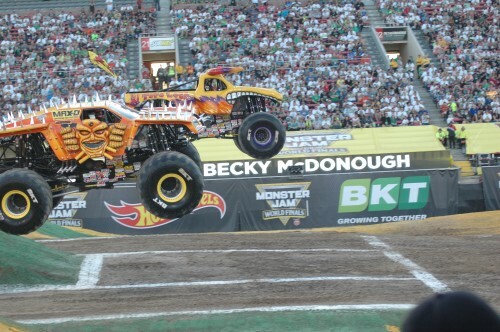 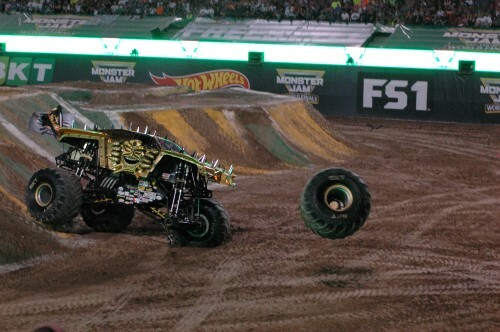 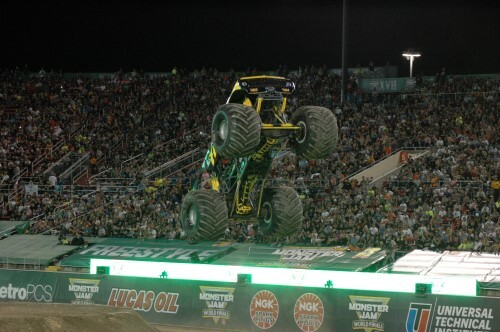 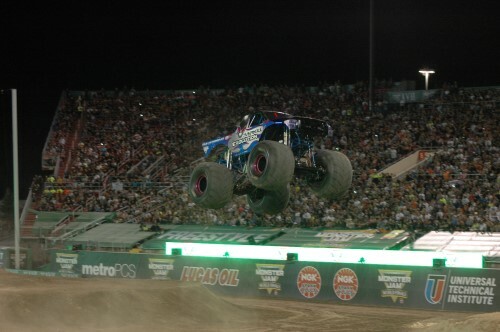 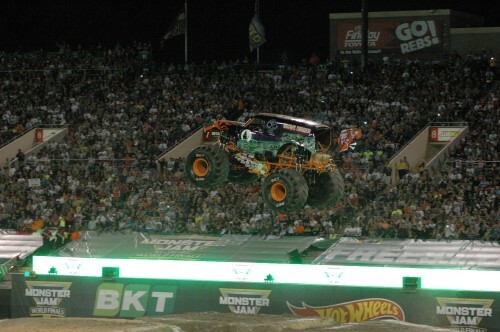 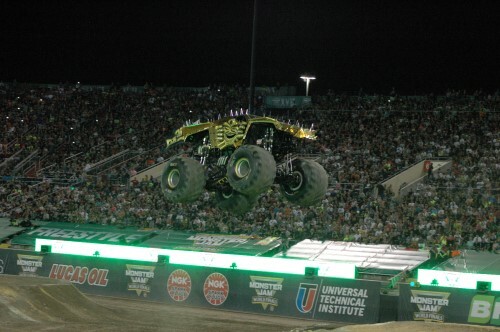 When I think Monster Jam I think of screaming motors, side by side racing, and big jumps. 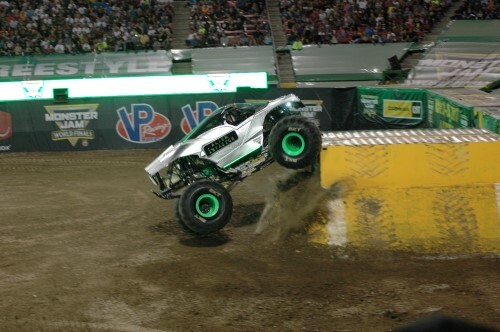 The Young Guns get to battle it out for a spot in the big show. 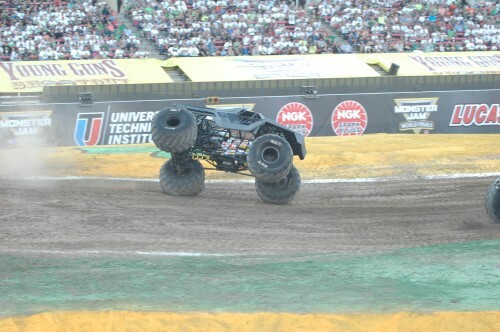 The height these trucks reach on a jump is amazing, I am not sure the pictures do them justice. 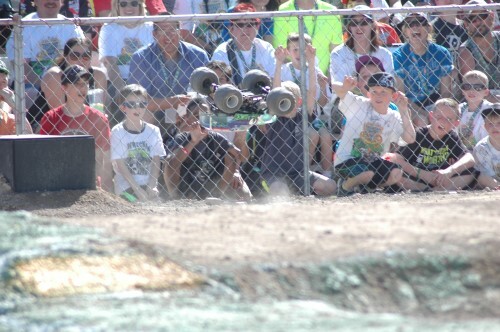 Drivers wow the crowd with some very nice saves. 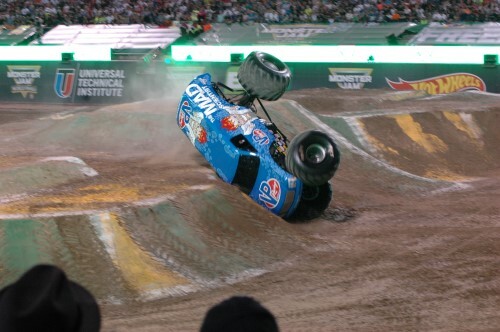 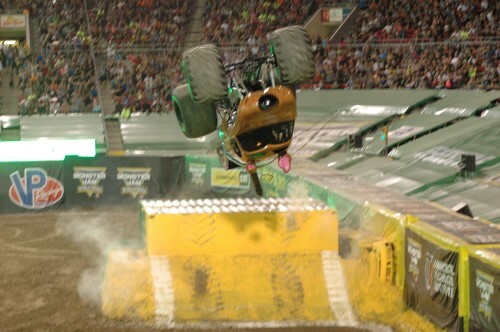 The other side of Monster Jam would have to be the spectacular freestyle event. 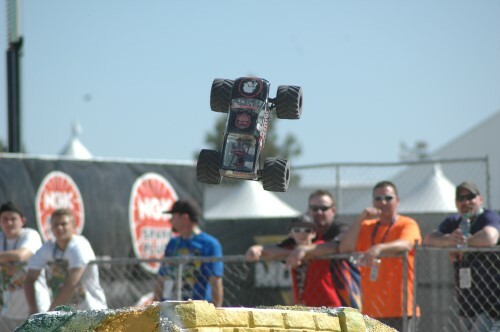 These drivers come in with big air and really put on a show! 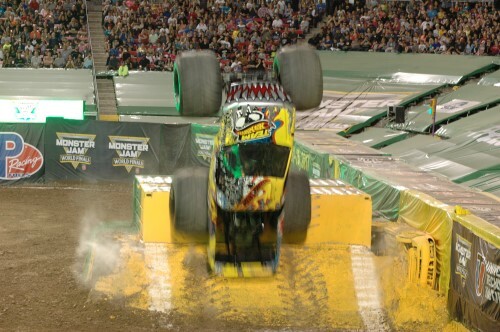 The crowd roars when destruction seems inevitable and the drivers save it. 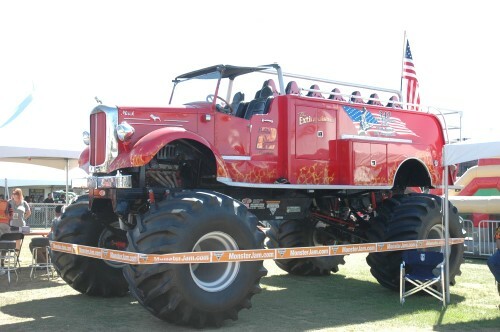 Malfunctioning rear steer and Max-D still puts on a show. 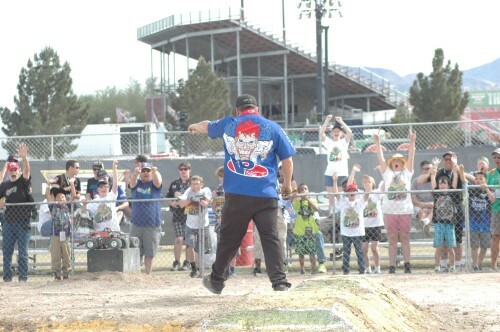 The crowd cheers as he goes big. 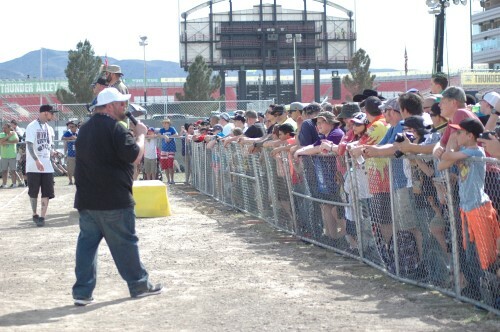 The fans are getting their money’s worth for sure. 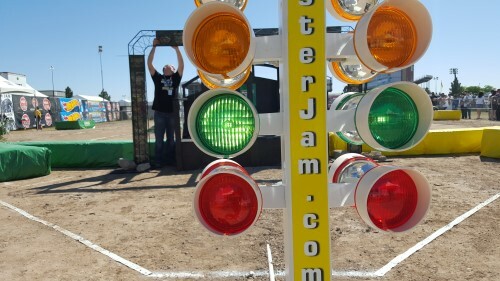 The freestyle course is open to whatever you can make happen. 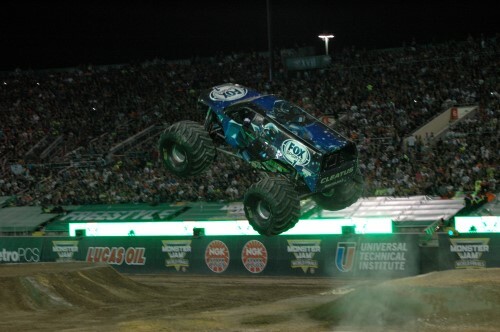 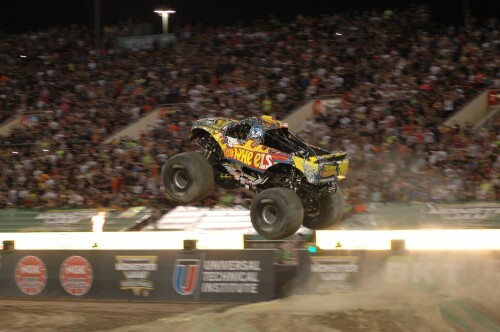 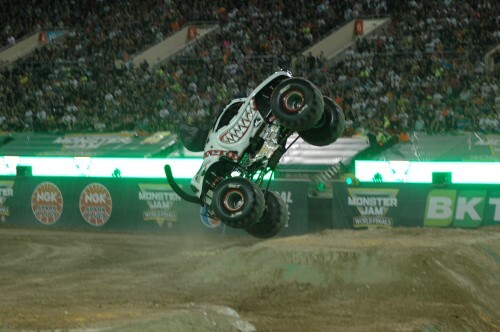 You’re already in a Monster truck, now imagine looking straight up. 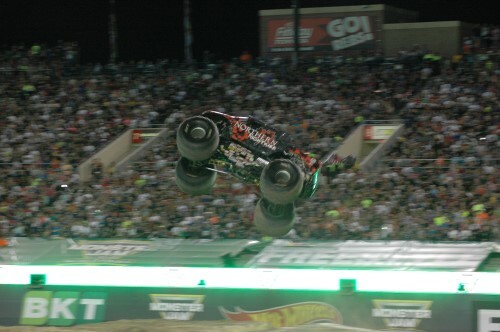 A little nerve racking, right?! 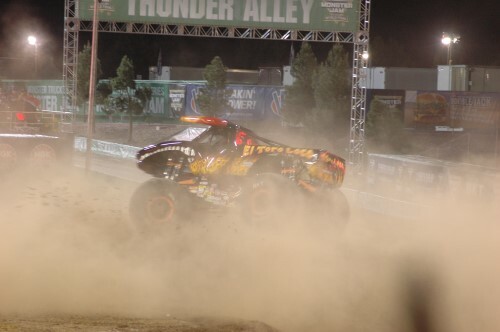 El Toro Loco black kicking up dust in this cyclone. 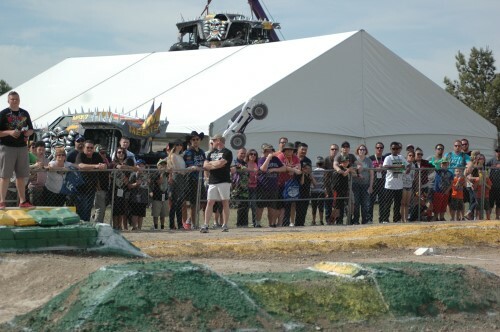 The crowd gets pumped up with every rotation of the truck. 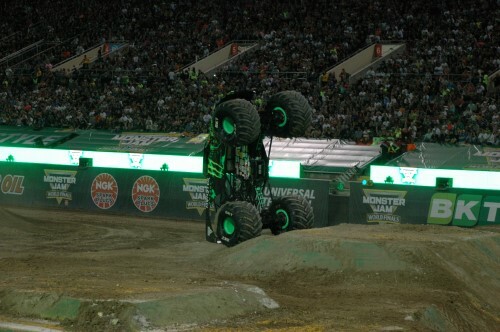 Its deafening in here as this Monster Truck pulls off a backflip. 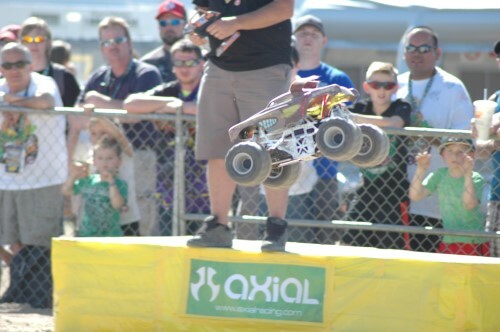 Everyone jumps to their feet. 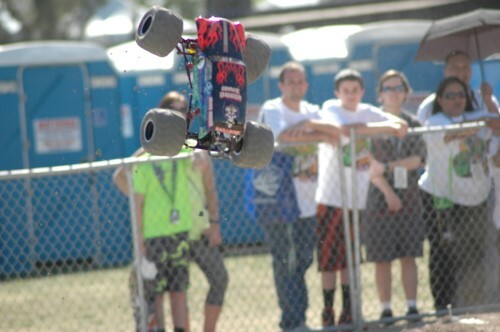 Big air did lead to some destruction. 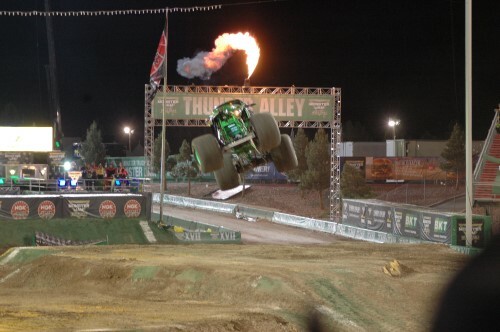 At the end of the night you can tell these guys really enjoy what they do. 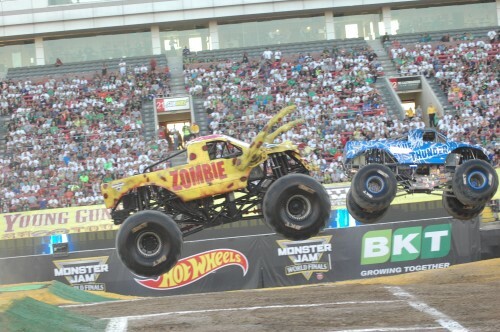 Like Zombie driver Bari Musawwir. 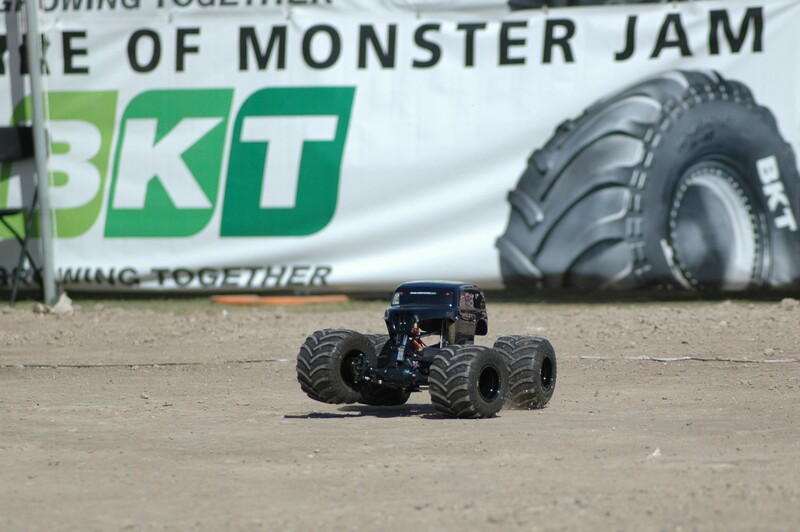 Bari is really into RC Monster Trucks as well as being a professional full size driver. 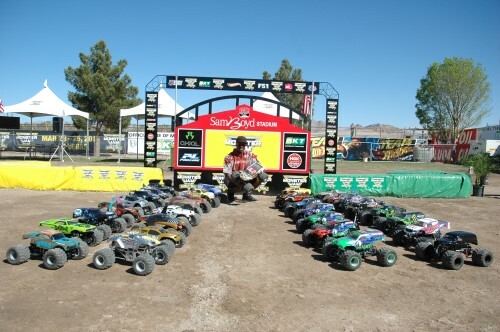 He has invited 16 drivers from around the US who are also here for the RC Monster Jam World Finals. 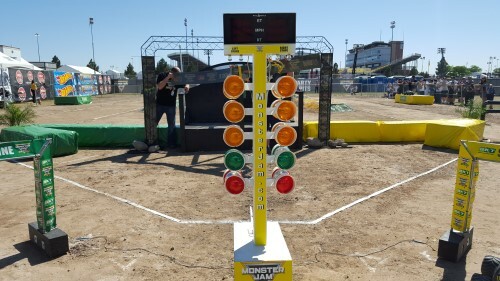 Here is the field. 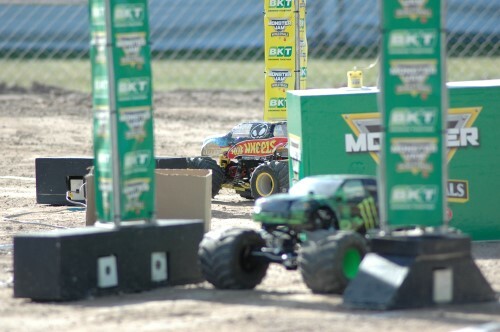 32 replica builds of the 1:1 monster trucks that are here to compete. 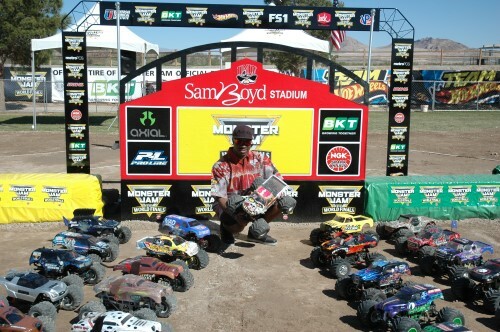 Here are the dedicated 16 drivers. 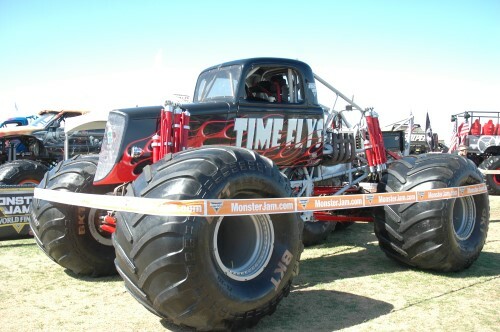 These guys have built 2 replica trucks each and in true monster truck fashion some have even brought back ups. 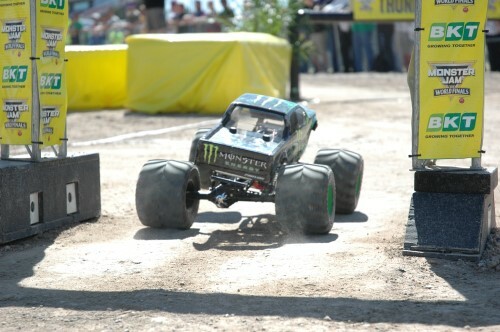 Just like the 1:1 they have a Thunder Alley and fully functioning tree. 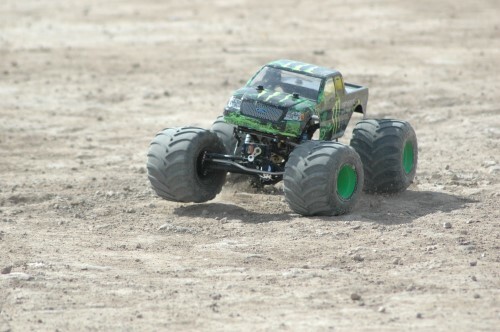 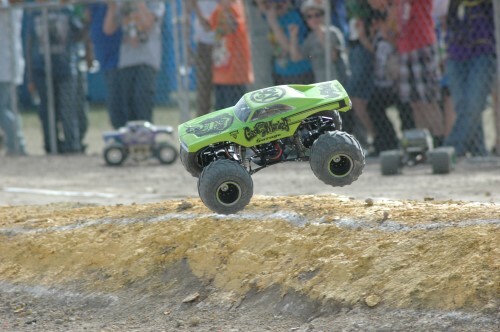 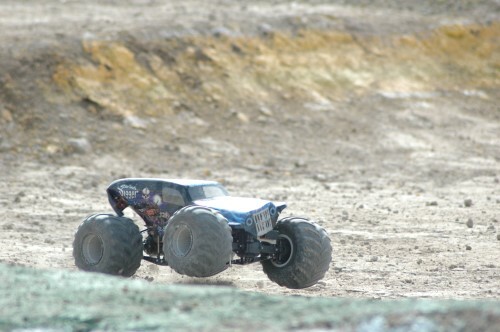 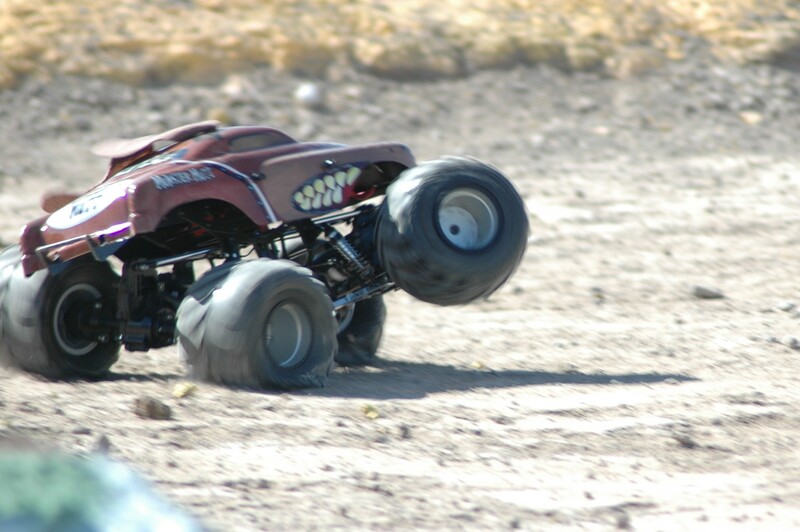 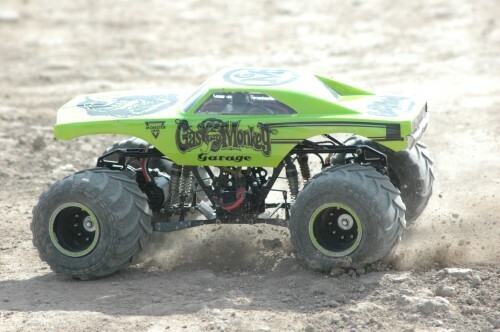 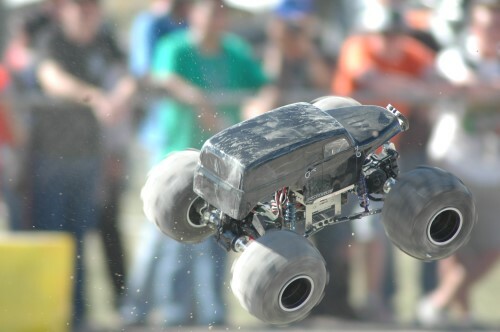 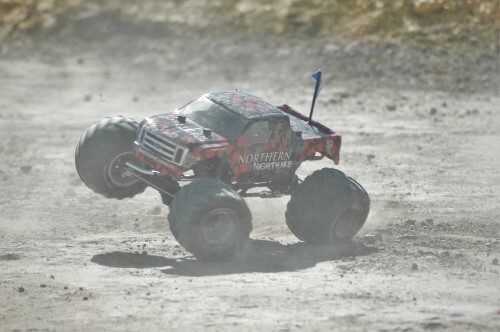 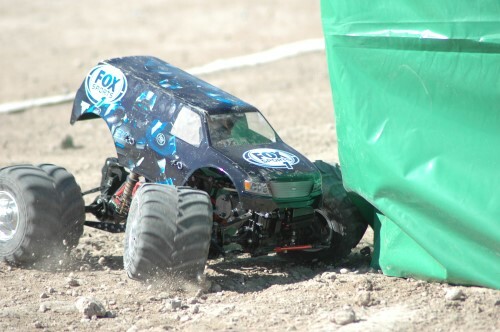 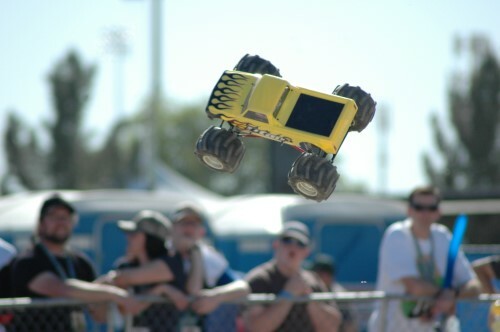 Did you ever think to use Axial AR60s on a Monster Truck? 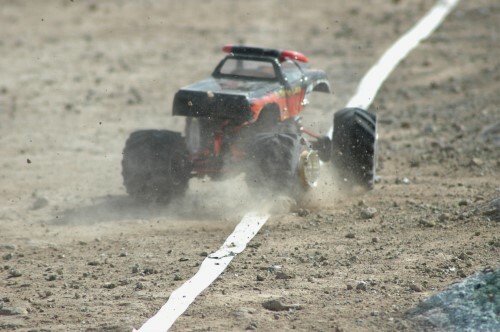 Just like the real trucks, there was a day of qualifying in both lanes. 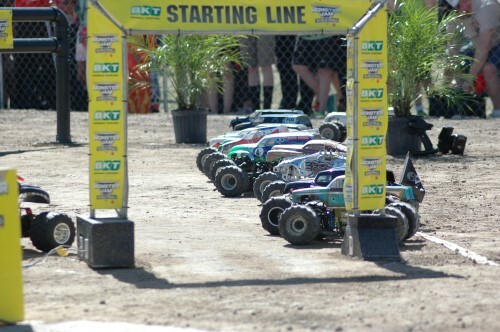 A lot of these guys are carpet racers so the dirt took some getting used too. 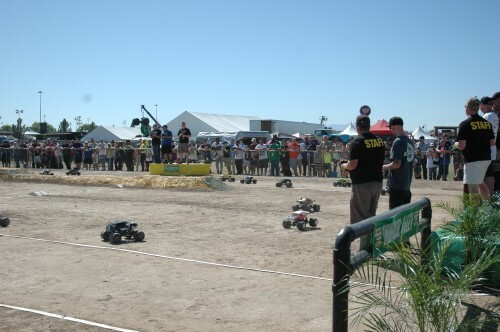 A race could be decided in the corners, so some pushed while others found their limits. 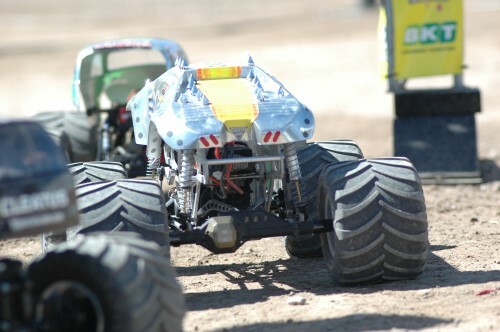 These guys were looking for traction anywhere. 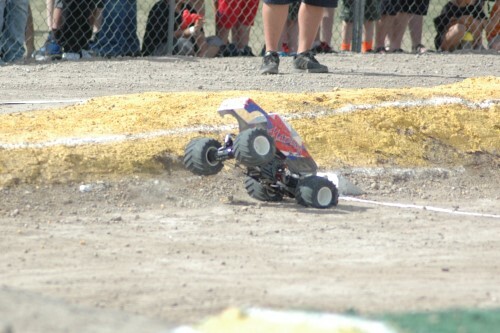 Some had a favorite lane and some just adapted their driving style. 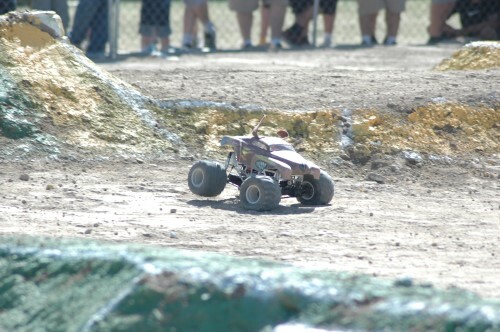 When race day came around these trucks had some people coming by to see how their mini version was doing. 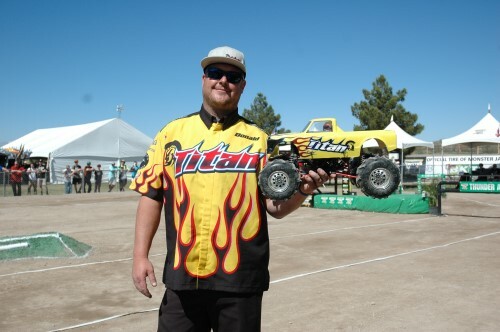 Monster Energy truck driver Coty Saucier came to check out the Mini Monster Jam. 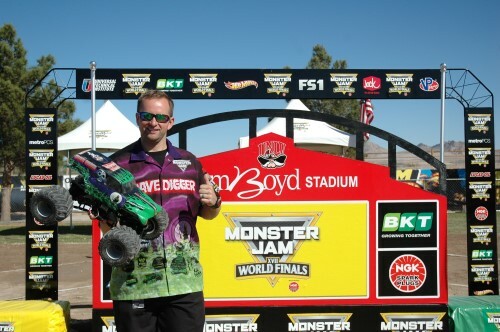 Grave Digger Purple driver Adam Anderson. 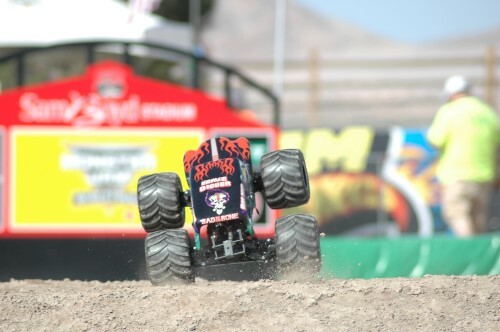 Son uva Digger driver Ryan Anderson – also a crowd favorite. 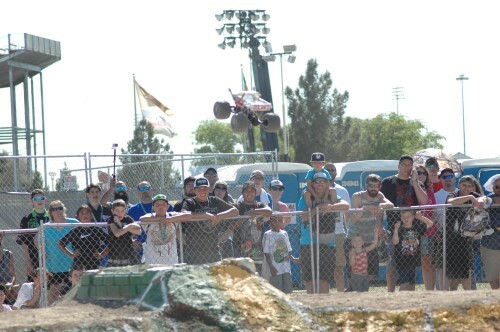 Madusa drivers Debrah Miceli and Young Guns driver Brianna Mahon coming to see what the Mini Jam is all about. 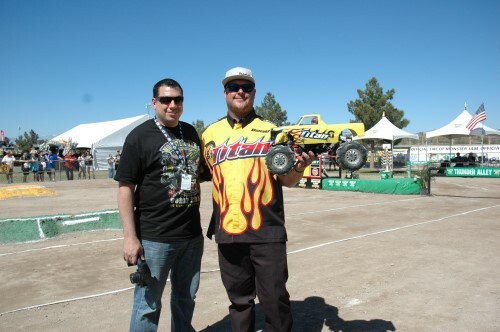 This was also a chance for the RC builders like Leigh Guarnieri to meet the 1:1 drivers like Donald Epidendio. 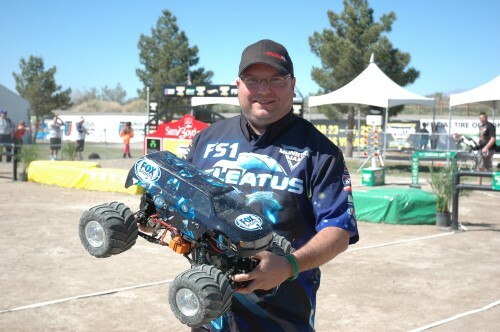 FS1 Cleatus driver Frank Krmel paid the track a visit and checked things out. 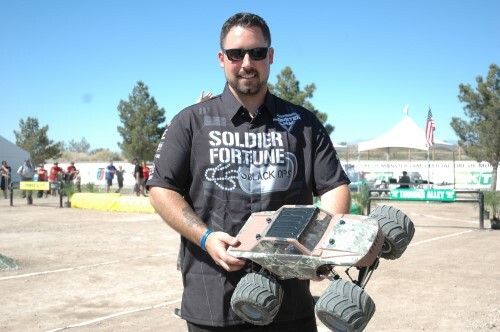 Soldier of Fortune driver Tony Ochs said he may have to get one of these. 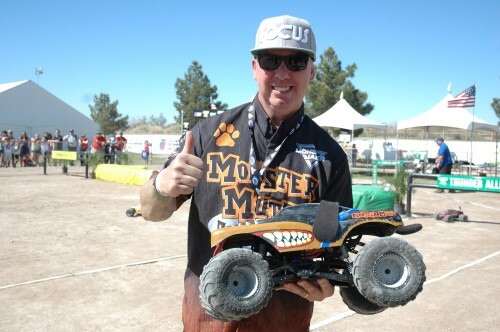 Monster Mutt Rottweiler driver Rod Schmidt giving a thumbs up of approval. 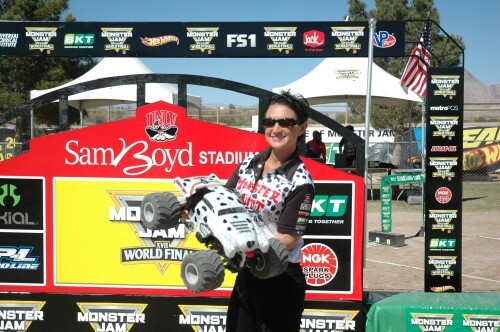 Monster Mutt Dalmatian driver Candice Jolly stopped by as well. 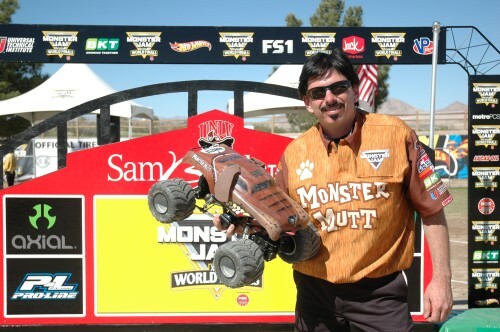 Monster Mutt driver Charlie Pauken was on hand also. 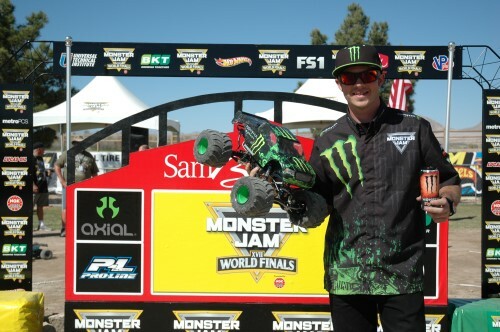 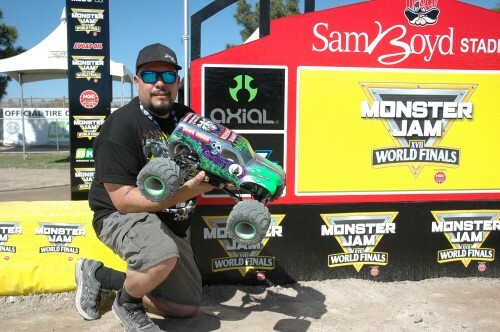 Gerardo Gonzales and his Axial AX10 Deadbolt platform Grave Digger Chrome take the win 2 days in a row in the side by side racing. 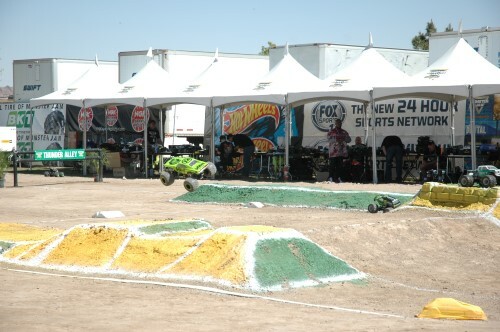 Well the masses have gathered here on the third day of the RC Monster Jam World Finals for the freestyle event. 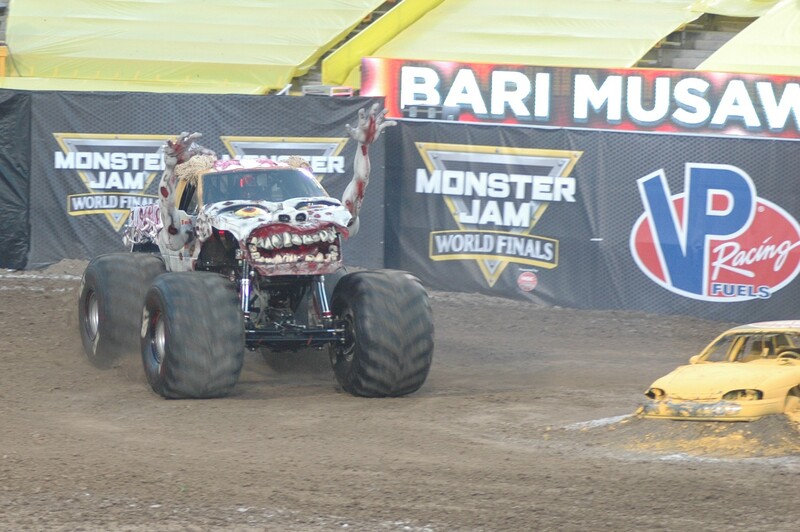 The drivers did a parade lap, just like you see at the 1:1 Monster Jam. 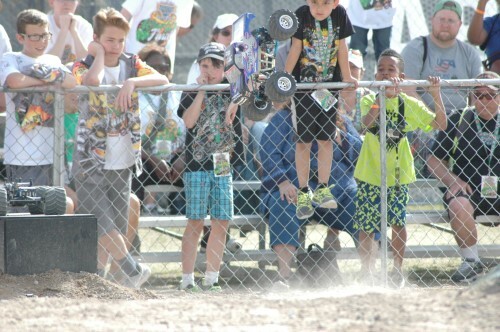 These guys came to see big air and cheer on their favorite trucks. 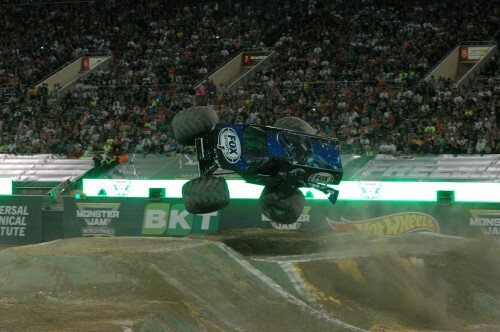 You can see the shock these trucks are taking on impact from the insane amounts of air these guys are catching. 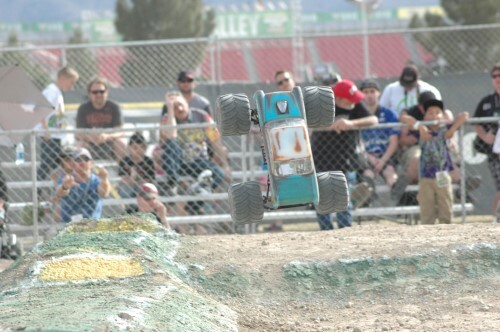 Drivers are throwing everything they have at the freestyle course. 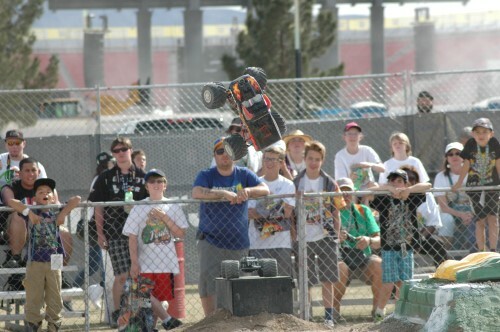 Just like their 1:1 counterparts these guys are throwing backflips in the mix. 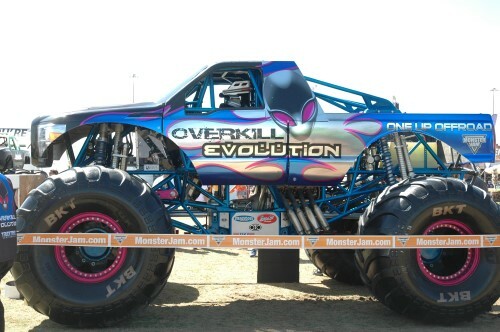 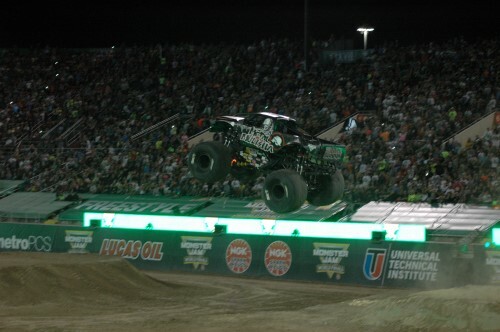 Grave Digger Chrome above and Overkill Evolution going really big pictured below. 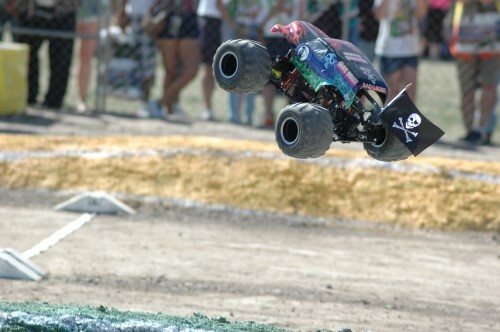 Big air will bring some destruction. 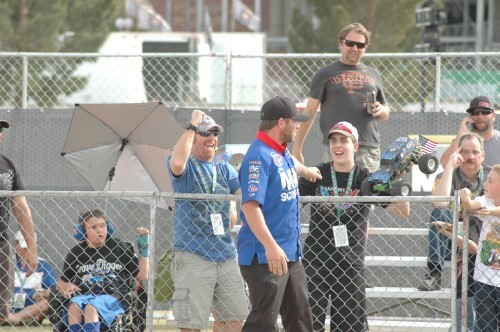 Some lucky fans were given a treat. 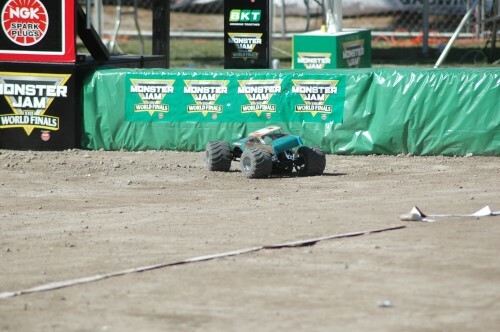 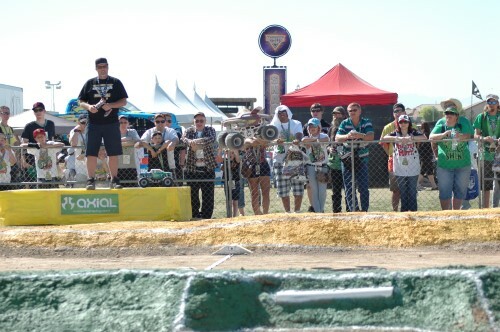 The RC drivers had the 1:1 drivers give the RC shells to the crowd! 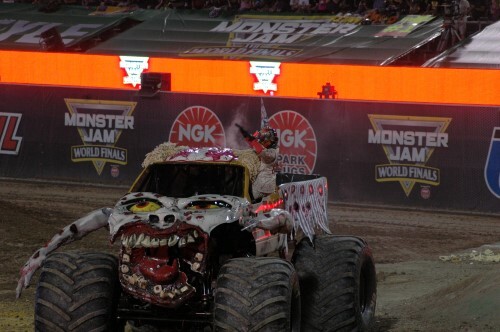 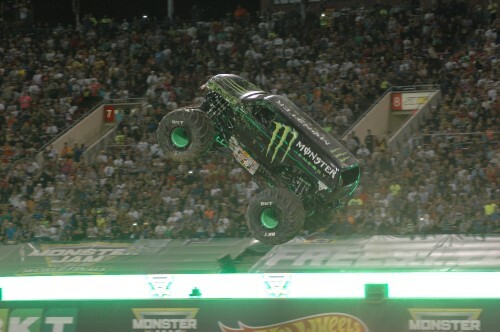 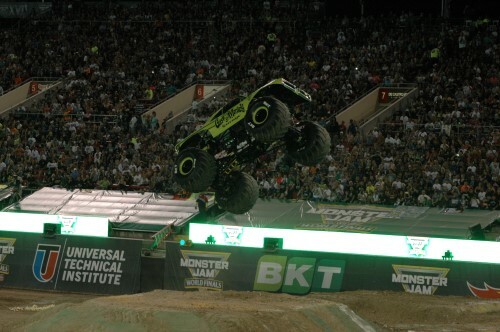 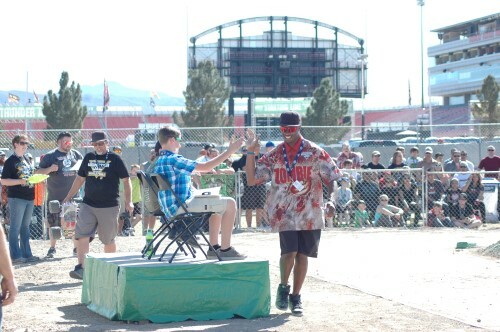 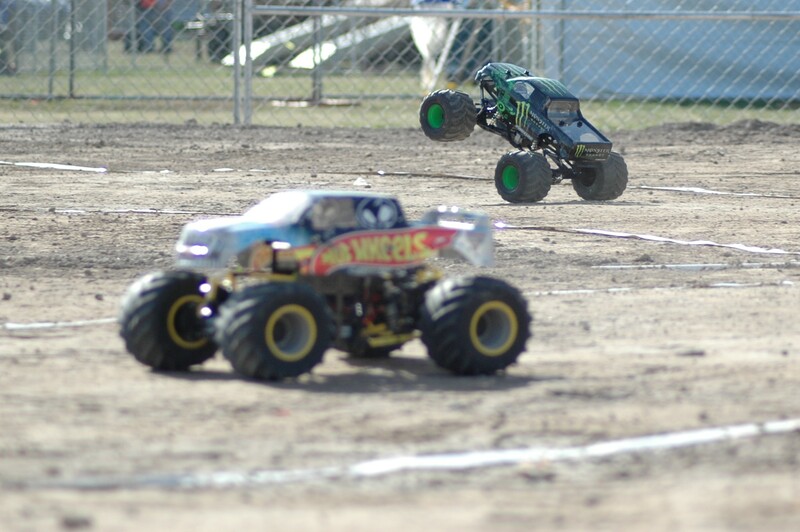 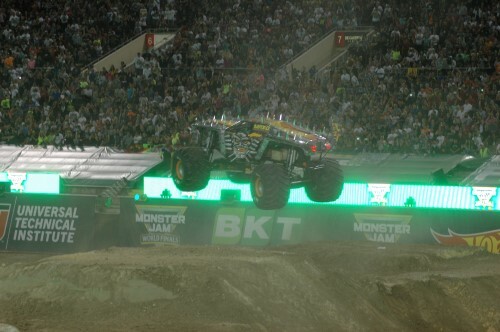 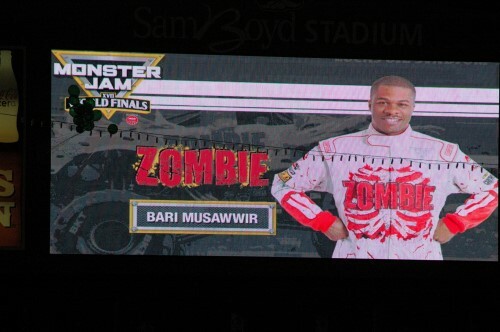 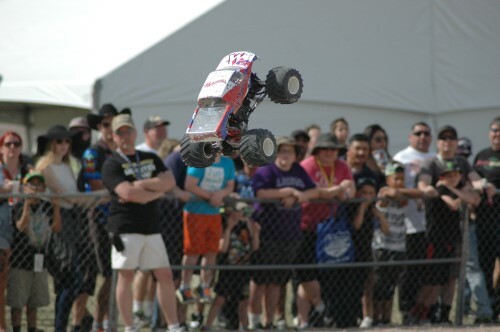 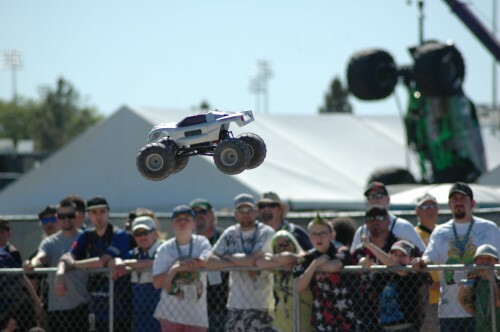 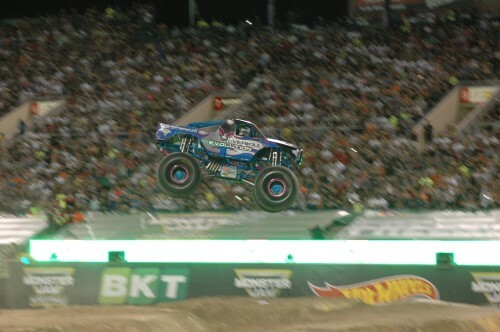 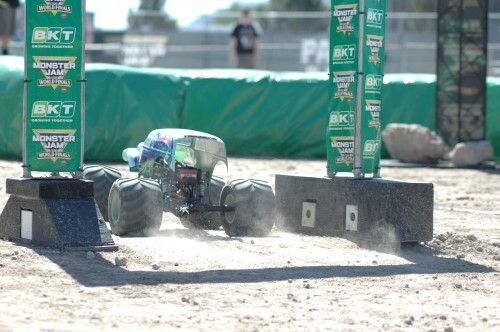 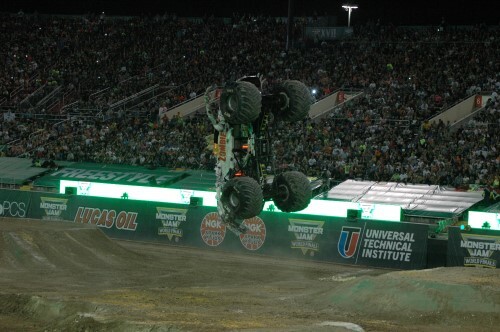 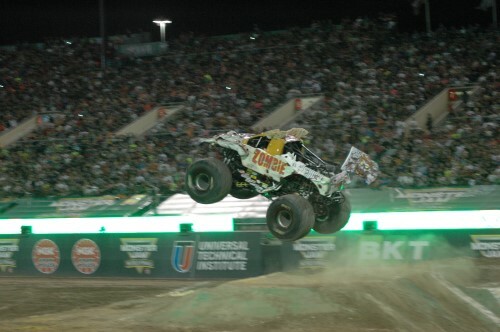 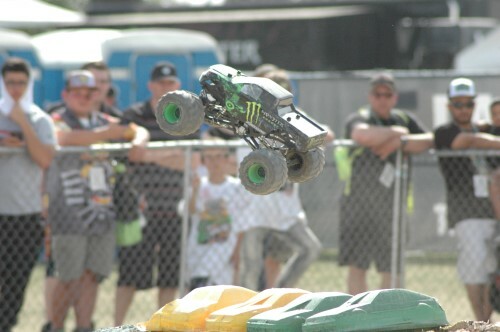 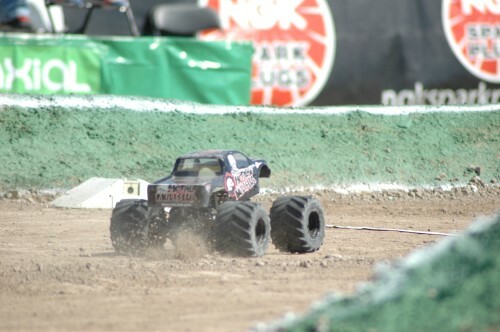 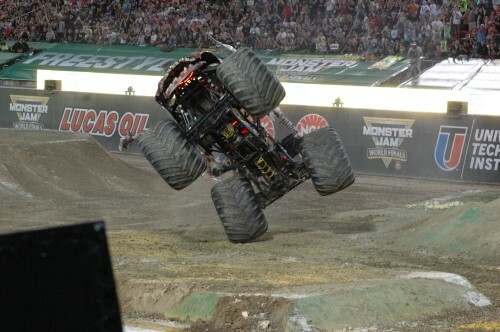 Bari Musawwir also Doubling Down and giving the fans a show with the RC monster truck Zombie. 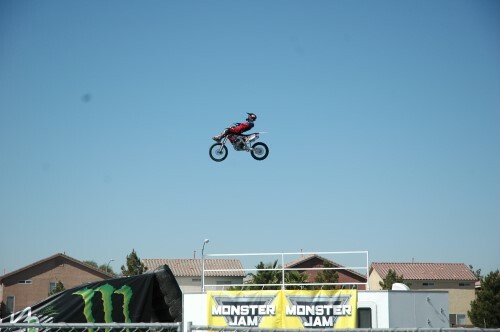 Big air and leaving nothing to chance, he was putting on a show and having fun! 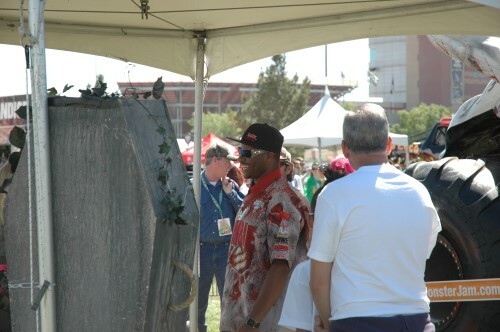 Talking to the 3 celebrity judges as he makes his way off course, still smiling. 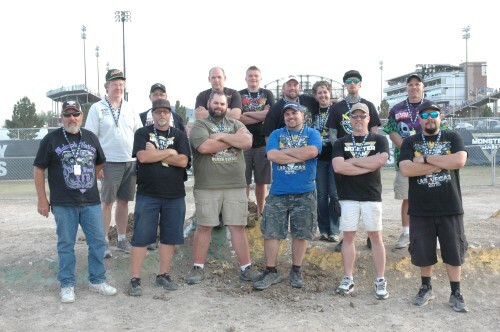 Here are 14 of the 16 dedicated RC Monster truck drivers after 3 days of competition. 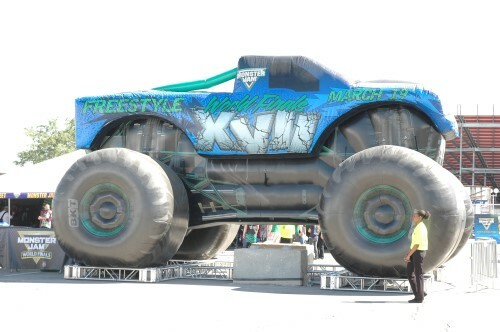 Now it’s their turn to go watch the big show, Monster Jam World Finals Freestyle. 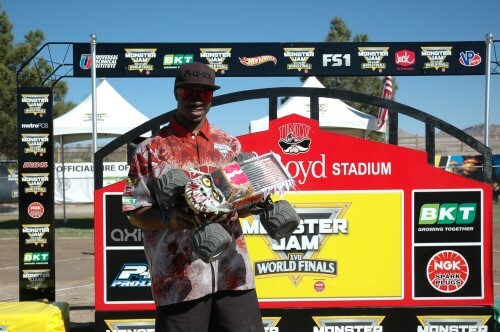 Bari Musawwir Driver of Zombie – 2011 Rookie of the Year, 2012 Young Guns Champion, and nominated for the 2016 Arena Freestyle Driver of the Year. 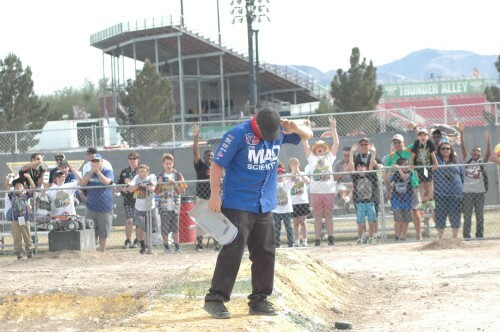 Win, lose, or draw he wants fans to enjoy the show. 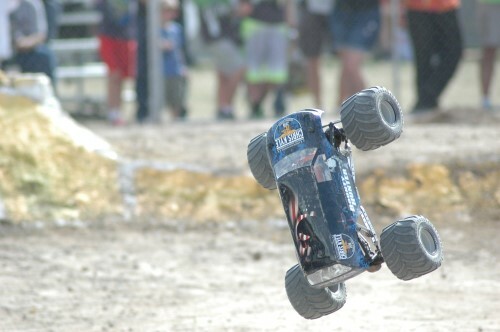 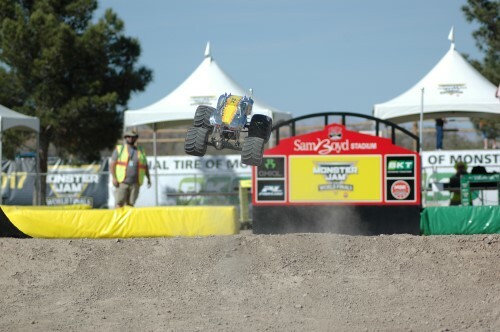 He is living his dream; he was actually an RC driver before being approached to drive full size Monster Trucks. 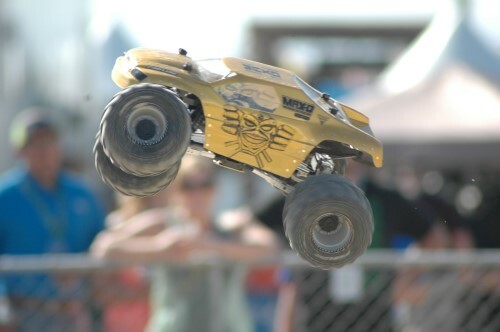 So do what you enjoy and always have fun. 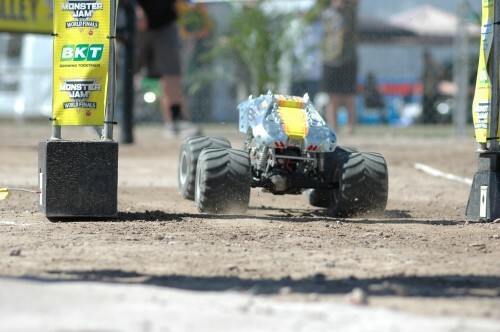 You never know where it will lead you!